Figure 24.1. Serum and urine FLCs in four patients with light chain multiple myeloma (LCMM) or AL amyloidosis. Figure 24.2. Amounts of sFLCs required to produce light chain proteinuria for κ and λ myelomas. The median (line), 95% ranges (boxes) and 100% ranges (whiskers) are shown. (Courtesy of MR Nowrousian). As described in Chapter 3, serum FLCs (sFLCs) are cleared primarily through the renal glomeruli and then metabolised in the proximal tubules of the nephrons. Only when the tubular absorptive capacity is exceeded are significant amounts of FLCs observed in the urine as “overflow proteinuria”. Since normal production is about 500 mg/day and the renal absorptive capacity is 10 - 30 g/day, production must increase many times before urine contains measurable quantities of FLCs . The clinical effect of renal tubular absorption on urine FLC concentrations is shown in Figure 24.1. Serum and urine FLC concentrations were compared in four patients undergoing treatment . Patients 1 and 2 had large amounts of serum and urine FLCs with good correlations between changes in concentrations. In patients 3 and 4, urine FLC excretion was minimal and unchanging over many months, while serum levels could be used to monitor the changing tumour burden. 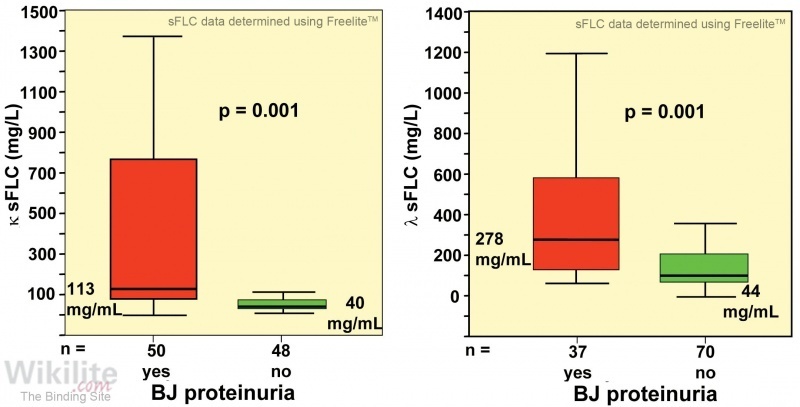 Despite similar sFLC concentrations, there were no urine FLCs in these latter patients because there was no renal impairment, and therefore, no overflow proteinuria. Nowrousian et al. studied the concentrations of sFLCs necessary to cause overflow proteinuria and a positive urinary immunofixation electrophoresis (uIFE) test result, in a group of patients attending a myeloma clinic. Of 98 serum samples with monoclonal κ sFLCs, the corresponding urine was positive for monoclonal FLCs (urinary Bence Jones protein; uBJP) by uIFE in 51% of cases. The median κ sFLC concentration associated with positive uBJP was 113 mg/L (range 7 - 39,500), and 40 mg/L (range 6 - 710) for negative urine (Figure 24.2). Of the 107 serum samples with monoclonal λ sFLCs, the corresponding urine was positive for uBJP in 35% of cases. The median λ sFLC concentration associated with positive uBJP was 278 mg/L (range 5 - 7,060), and 44 mg/L (range 3 - 561) for negative urine. The large overlap of sFLC concentrations between patients with/without uBJP presumably reflects differences in renal reabsorptive capacity and the extent of renal damage between individuals. Thus, median sFLC levels associated with uBJP were 5-fold above normal for κ-producing patients (upper limit of normal range: 19.4 mg/L) and 10-fold for λ patients (upper limit of normal range: 26.3 mg/L) when the urine contained uBJP. The higher serum levels necessary for λ overflow proteinuria can be explained by the dimerisation of λ molecules. This reduces glomerular filtration compared with monomeric κ molecules (Chapter 3). Therefore, when FLC production is below the renal reabsorptive capacity, serum tests are more sensitive than urinalysis for detecting monoclonal FLC .